Remember your first speech therapy office? I do. I went to school and found an empty room and a lot of wall space to decorate. I put up some inspirational posters and my college flag. Man I loved that space. It motivated me and I felt happy there every day. By mid-year the posters were replaced with hand drawn anchor charts and visual supports for different students on my caseload. Fast forward 8 years and I have a totally different perspective on the functions of the space I work in. My first priority is to use them in a way that works for me for instruction. There’s also the consideration of sensory overload in the space, students who are easily distracted, oh and still the fact that is has to be a place you actually want to spend 8 (10?) hours a day. Bulletin Board space is prime time space and you’ve got to make it count. 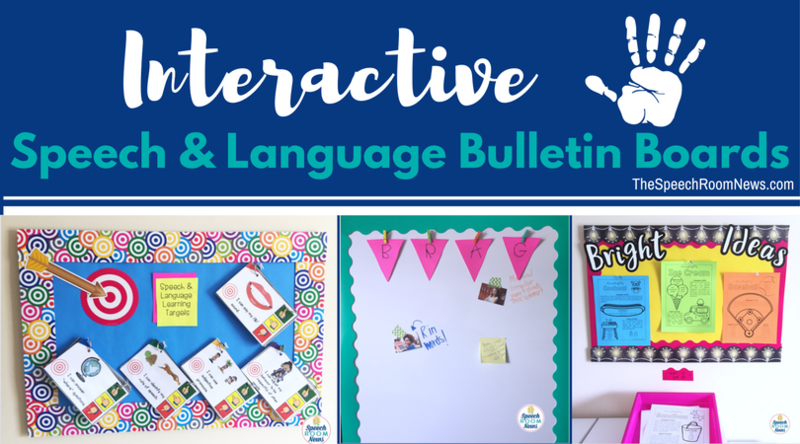 Here’s three ideas for interactive speech and language bulletin boards. Throwing learning target on book rings makes them easily accessible! Put them on a hook in your bulletin board and you can easily pull down the accessible bulletin board pieces and put them in front of your students. It helps give focus to your students and increasing their self-awareness. 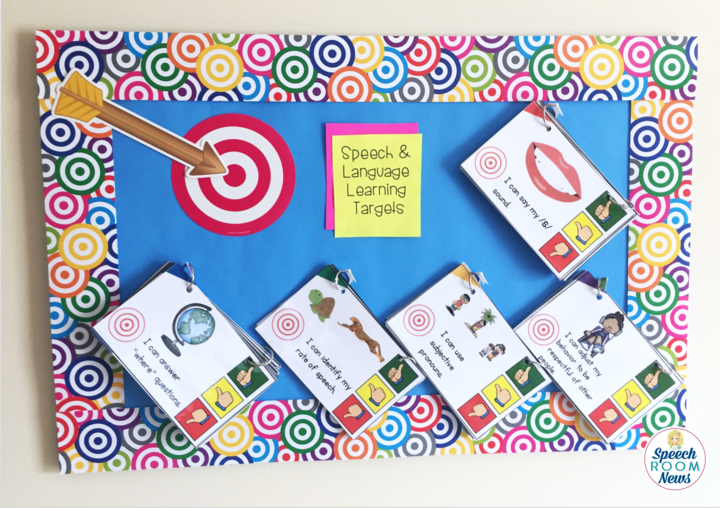 My learning target cards are available here. 104 cards are included and each include a learning target that is CCSS aligned. If you serve in a school with parents who bring their children for speech therapy this is perfect. Many SLPs see their preschool students in this service delivery model and maybe even some of their school-aged students. If you don’t get parents in your office, consider asking if you can put up a board near the school entrance! Start with some parent handouts. I have a list of my favorite preschool handouts. My preschool summer learning through play handouts are shown in the photo and available here. I like to put a tray or hanging file folder with the board so that parents can take a copy if they like! Promote carryover as much as you can! The other day I got a new toy (Amazon Affiliate link) called a an HP Sprocket. It’s a portable printer that works through bluetooth with your phone! You can print from your camera roll or from social media. It uses paper sticker sheets that include the ink, so the printer doesn’t need ink! I printed a bunch of fun pictures at home and then thought about how perfect it would be in the best to have at school to snap pictures of my students for a brag board! The photos actually print as stickers, so if you have a bulletin board to “brag” on your students’ accomplishments, these will stick right to it. Since I used a white board I attached them with washi tape. Make a brag tag board at the beginning of the year! During the first quarter, make sure you catch your students mastering a goal, using kind words, or being extra helpful! If another teacher catches them, write it on a sticky note and add it to the board! 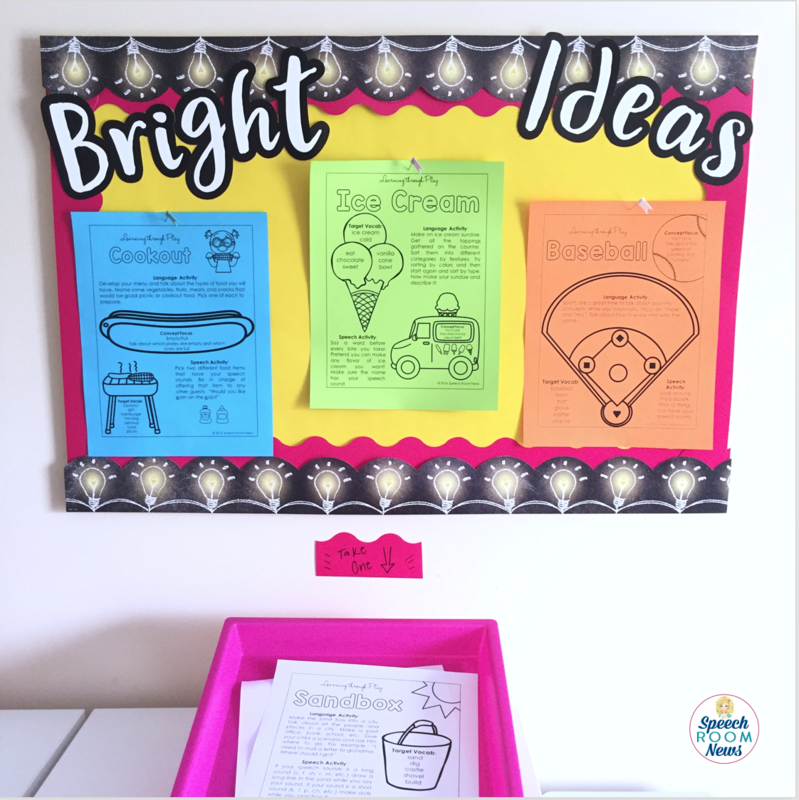 Those are three of my favorite interactive bulletin board ideas. Tag me on Pinterest if you see some other great ones! I’ve been struggling the past 2 weeks idea on how I should decorate my room without going overboard since my kiddos are very easily distracted. Less is more for my caseload and your decorating idea fit my bill. 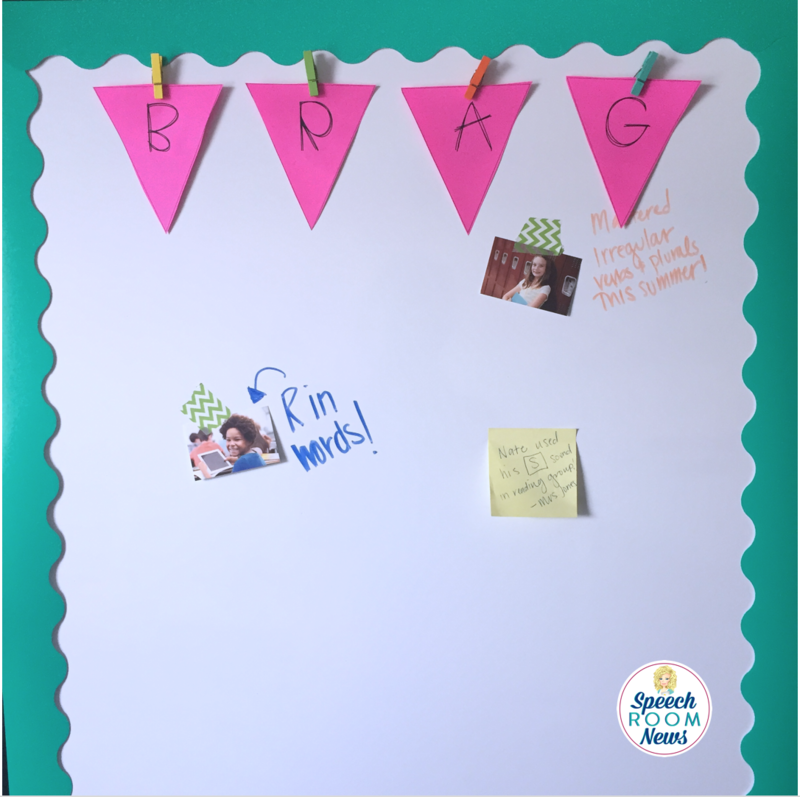 Love the idea of a Brag Board!…perfect for my kiddos!! Thank you for sharing. I love these ideas!!! I was just wondering about the brag board…any issues with confidentiality related to their IEP? I would love to put one up, but I’m wondering about this. Depends on your building! Certainly can’t be in the hallway! You could use student initials if you can’t post names anywhere in your room.